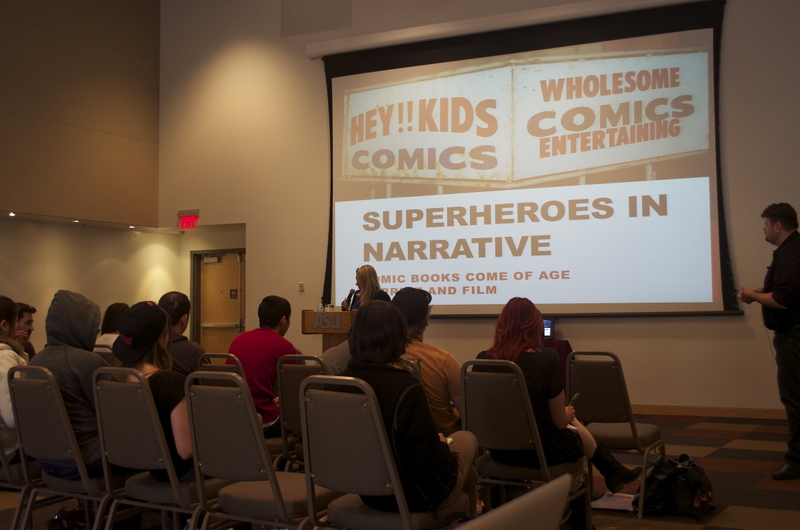 Professor Teague Bohlen recently visited ASU in partnership with Superstition Review and Project Humanities to discuss the evolution of the superhero in narrative. Along with providing a closer look at spandex tights and masks, Teague presented the history of comics as it relates to the rise, fall and comeback of the narrative. It was fascinating to learn how such seemingly small stories have affected the development of narrative structure over the last several decades. Teague began his talk by explaining that comic superheroes were not always the same virtuous characters they are today. In fact, he pointed out several instances where the early Superman and Batman figures instigated violence and actually killed people out of rage. Hollywood’s version of Clark Kent would never commit such an offense, so how did this change in character come about? At first, comics served a wide audience of children and adults with edgy story lines. In fact, comics were so popular in their early years that they became a strong force of advertising and propaganda during WWII. Who can resist the pressure when even “Captain Marvel joins the Navy”? However, after the war, comics returned to stories involving monsters, crime and homeland violence. In the 1950’s there was a shift in the content of comics with the adoption of the CCA—Comic Code Authority. While some people viewed the reduced violence and “criminal content” in comics as a benefit to society, Teague discussed the devastating effect these restrictions had on the narrative plots within comic books. As he put it, “Imagine if everything on television had to be appropriate for a 5 year-old.” Suddenly comic storylines became surface-level and simplistic, and a few publishers replaced the dialogue almost entirely with comic art. Fortunately, over the last decade comics have made an impressive comeback as publishers have bypassed the CCA and returned to a more creative approach to storytelling. Overall Teague’s talk left us with countless nerdy facts and a much greater appreciation for the role comics have played in the history of storytelling. I can speak for everyone present when I say it was a delight—and the superhero cookies weren’t half bad either. Thank you for a wonderful presentation, Teague. We do hope you come again. You can view a video of the presentation here. Brooke Passey is a senior at Arizona State University and the Student Editor-in-Chief of Superstition Review. In the spring of this year she will graduate with a Creative Writing degree and an emphasis in fiction. She is currently also working on two nonfiction books and several smaller works of fiction. After graduation Brooke hopes to establish herself as a writer and pursue a career in editing or publishing. So sad I missed this event. It sounds like it was an absolutely fascinating and informative presentation. Hopefully he’ll do another presentation like this again at ASU and I’ll be able to make that one. Yes, it most certainly was a delight! I loved the way Teague delved into the world of comics head-first, and was able to rattle off so much fascinating information; it was obvious that this is one of his greatest passions. I learned so much during the presentation, and it certainly was enjoyable for all, even for people like me who don’t have a lot of prior comic book knowledge. Come back and visit us soon, Teague!